Goodbye Messages for Girlfriend: The words you use to say goodbye should echo in her heart as she walks away. The best way to leave a lasting impression is to write a romantic quote on a card or a note. 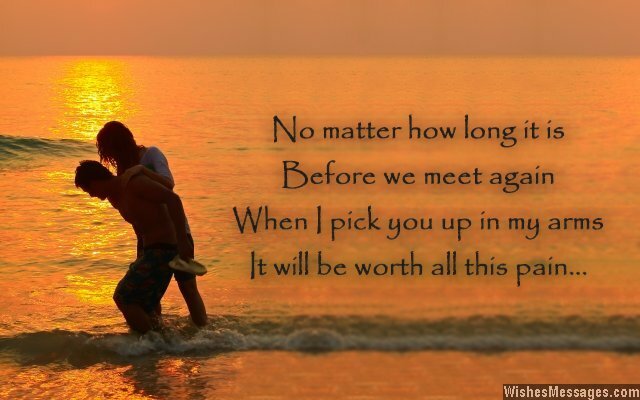 Give it to her when you both hug and kiss for the last time before you see each other again. When you’re away from each other, barrage her Facebook and Pinterest with cute messages. Send her sweet texts to let her know how much you’re missing her. If you’re going to be separated for a long time, give her a mushy handwritten letter as a keepsake. Whether it is college, work or family – embrace it in a sad but a beautiful way. Make it a befitting start to an awesome long distance relationship. Whatever the reason, whatever the situation – let your goodbyes reverberate how you really feel. 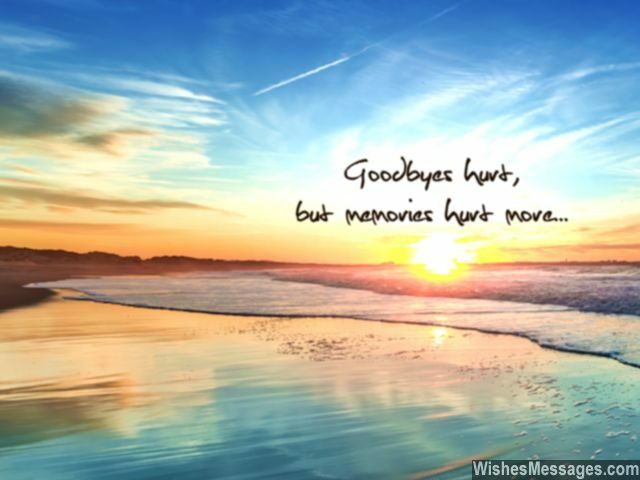 1) Goodbyes hurt, but memories hurt more. I’ll miss you. 4) I want you to chase your dreams. I want you to fly higher. I want you to enjoy all the adventures life throws at you. But when you are done dreaming, flying and achieving, don’t forget there is someone waiting for you, at the place from where it all started. Goodbye. 5) I am trapped in the cage of your love and you are taking its key with you. Goodbye. 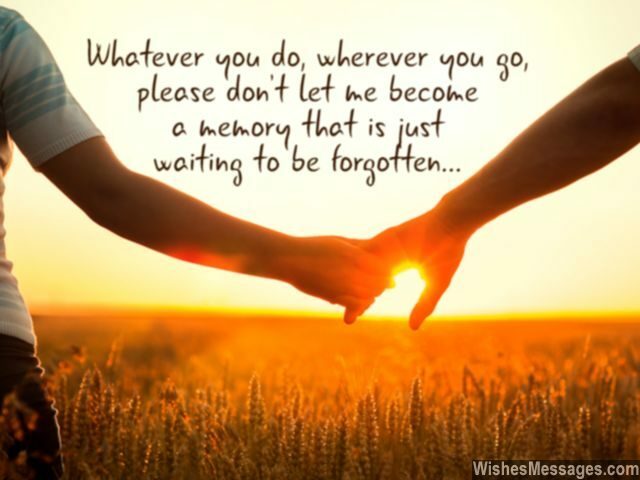 6) Whatever you do, wherever you go, please don’t let me become a memory that is just waiting to be forgotten. Goodbye. 8) The only thing that has the power to calm the bitterness of a Goodbye, is the hope that the Hello Again will be sweeter than anything you can ever imagine. 9) Never in my wildest imagination did I ever predict that I would have to force a smile while saying such a cruel word – goodbye. I’ll miss you. 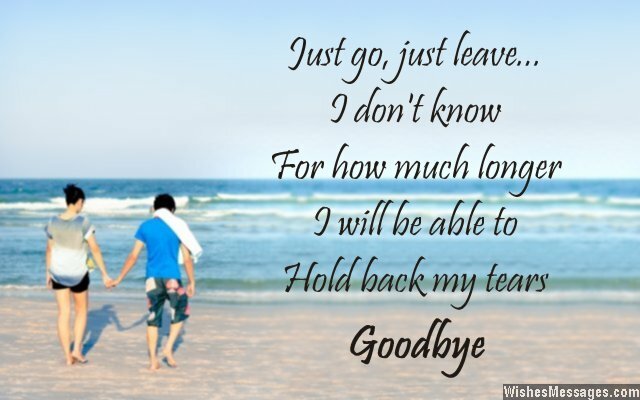 10) The only thing that makes a goodbye less painful is the hope that distance will make us stronger. 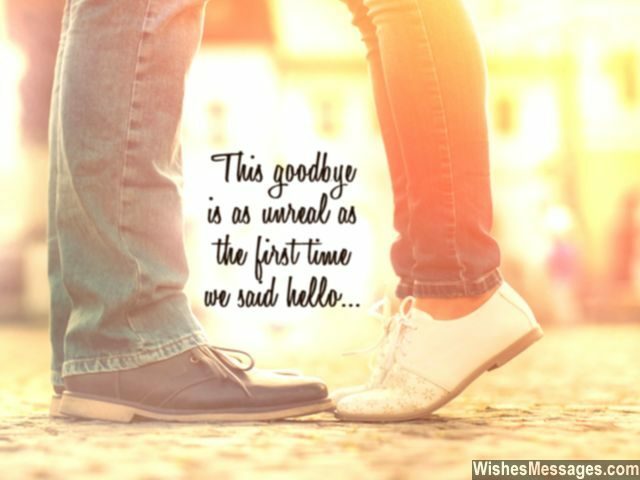 11) This goodbye is as unreal as the first time we said hello. I’ll miss you. 12) I’ll try to soothe the strain of this goodbye with the bliss of our beautiful memories. 13) Things were never meant to be this way, I never thought I’d see this day. I can’t bear to see you walk away. Every step you take, stops my life astray. Goodbye. 14) To you, I’m never going to say goodbye. Not even if we cry. Not even if we die. 15) Wherever you go, whoever you meet, just remember that there is this guy who loves you best when you have no makeup on. Goodbye. 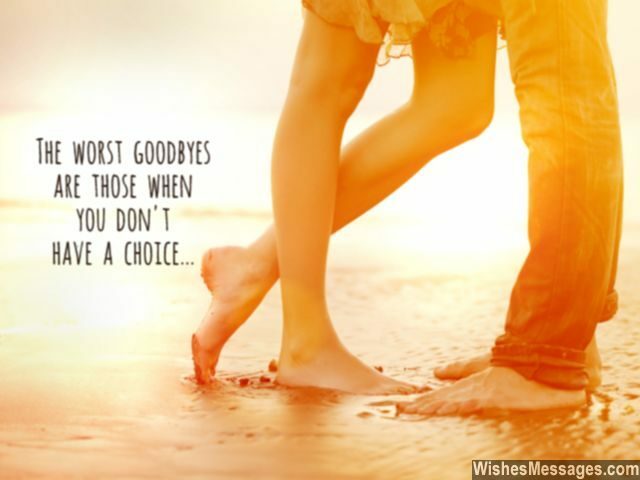 16) The worst goodbyes are those when you don’t have a choice. This is one of them. I’ll miss you. 17) I ask myself why life has to take me away from someone who means the world to me. Maybe this goodbye was never meant to be. 18) Until today we were busy living life to the fullest. Now begins our love story. Goodbye. 19) Goodbyes are hard, especially when you have to say it to someone who you never want to be away from. This is one such goodbye. 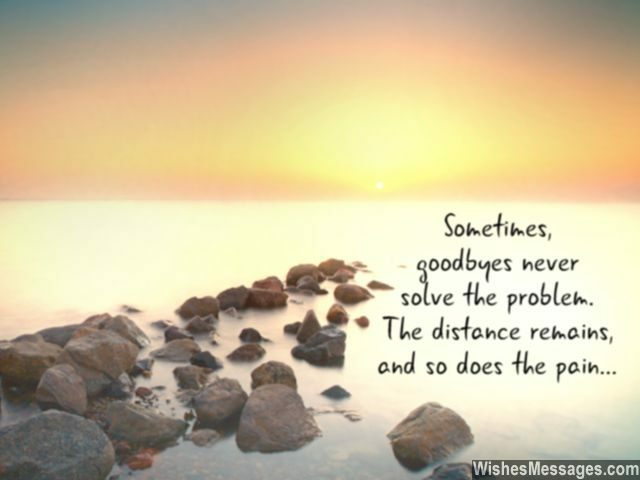 21) Sometimes, goodbyes never solve the problem. The distance remains, and so does the pain. 22) I don’t want to give you a goodbye hug, because I know that once I give it… I’ll never want to let go. 23) Time is a funny thing. It flew when we were together and now that you’re going away, every passing second will seem like a lifetime. Goodbye. 26) Just go, just leave… I don’t know for how much longer I will be able to hold back my tears. Goodbye. 27) The only reason I am HAPPY saying goodbye is because I want to see you HAPPY saying hello to new opportunities. Goodbye. 28) If you could actually see my feelings, you’d never say goodbye. 29) My heart is going to bleed every step of the way when I walk away. But at least I will be able to follow the drops of blood back to you. Goodbye. 30) It’s amazing how a word as small as goodbye has made me discover love for you in the depths of my heart that I never knew existed before. Goodbye. 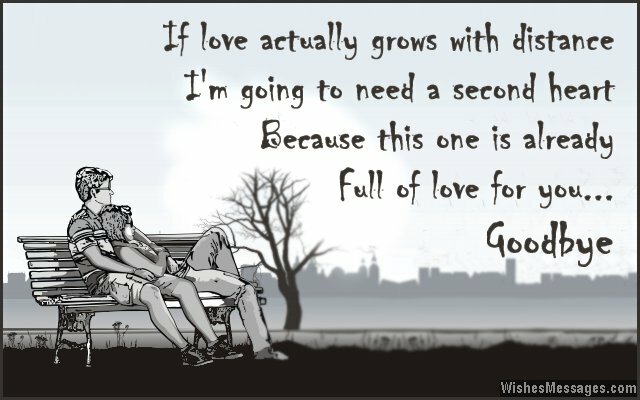 31) If love actually grows with distance, I’m going to need a second heart because this one is already full of love for you. Goodbye. 32) I’m not mad, I’m just sad. I’m not angry, I’m just gloomy. I’m not worrying, I’m just crying. Goodbye. 33) All this pain and agony of being apart will become worthwhile, on the day you achieve your dreams and make us both smile. Goodbye. 34) I promise to think of our beautiful memories, but never to think of them as the past. Goodbye. 35) Spending time apart will make me miss you a lot, but I promise that no amount of distance can ever make our love rot. Goodbye. 36) No matter how long it is before we meet again, I bet the moment I pick you up in my arms will be totally worth the pain. Goodbye. 37) I am not going away only to pursue MY dreams. I am going away to pursue the dreams which will help us live OUR dreams together. Goodbye for now. 39) It’s not that I don’t believe in long distance relationships. But nothing can come close to the feeling of having you sit in my lap and whispering sweet nothings in your ears. I’ll miss you, goodbye. 40) There’s no such thing as a nice goodbye. No matter how tightly I hug you, seeing you go away will shatter me from the core. I’ll be waiting.